“Great presenters transform audiences”, and Resonate on the Apple iPad transforms business books. Resonate shows what’s possible when strong ideas combine with eye-catching delivery. Resonate is my first encounter with a business book on the iPad. Many e-books simply taken a traditional book format, and make them electronic, but Nancy Duarte has gone several steps further and supplemented text with videos, sound clips, and pop-out diagrams. Resonate resembles Doctor Who’s TARDIS; it’s way bigger on the inside than it appears from the outside. The book is packed with ideas, but the multimedia approach compress those ideas into shiny nuggets. Those nuggets are memorable, and when you take the self-assessment quizzes at the end of each chapter, you’ll be surprised at how much information you absorbed in a short time. The standout message of Resonate is that the audience is the hero. You are the mentor. You are Yoda guiding Luke Skywalker. Your role as mentor is to launch the audience onto a journey that leads to new insights and discoveries. This mind-shift to presenter as mentor subtly shifts your presentation style. I tried the shift for myself during a three day training class and I found that it made me a kinder presenter, a more patient presenter, and at times, willing to be a far more challenging presenter. The topic of story-telling has attracted so much online comment in the past year that it’s almost become an internet meme. But what does “storytelling” in a presentation context actually mean? To the average person storytelling involves starting with the phrase “Once upon a time” and then ending with “…and they all lived happily ever after”, but what should go on in the middle? The storytelling buzz leaves many presenters confused. Resonate actually explains how the process works. Nancy Duarte uses examples from literature and cinema, and combines them with the work of Hollywood script analyst Chris Vogler. In my favorite section of Resonate, Nancy uses the full potential of the iBook to combine Chris Vogler’s video-tutorials on storytelling with expandable diagrams that lay-out the storytelling process; a process known as “The Hero’s Journey”. This work on The Hero’s Journey not only applies to presenters, but also represents the stages a customer passes through on the way to a major purchase. 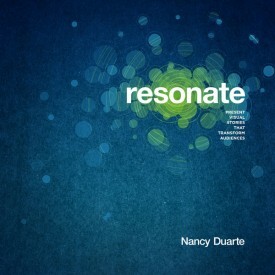 Resonate is therefore a great book for salespeople. The third key idea in Resonate is the use of the Story Form, a shape describing the accordion push and pull between the opposing tensions of what is, and of what could be. The tension between these two points creates contrast between an audience’s current situation, and the improved situation or “new bliss” that a presenter is describing. Resonate shows how to use a structure that flexes back and forth between these two points, creating a motion that propels audiences forward. Anecdotes from the author are an important part of business books. Nancy Duarte anecdotes are humorous, usually self-effacing, and always relevant. From how to save yourself when presenting while heavily medicated through how to prepare the ultimate beer presentation when you really don’t like beer, each anecdote brings to life another aspect of presenting. Finally, Resonate is tremendous fun to read. It has a huge personality, and while it centrally features Nancy Duarte, her whole team get’s pulled in as well. For my personal favorite, flick to page 21. Play with the slider that appears at the top of the page, and see what happens to Art Director Ryan as his image gets morphed to prove the point that your presentation isn’t all about you.